My mom is into Treeo Orem, and it's really nice and clean. The staff is really nice. They have an exercise place, a healthcare place, and the dining area looked nice. Treeo Orem had the features that my mother-in-law needed and it was ultimately her choice. They were very welcoming, helpful, and friendly, and have been ever since. The cleanliness was very good. The food was wonderful and that was one of the best parts of the place. We went to Treeo Orem, and it was very nice. It has independent and assisted living, but it's geared more toward somebody that needs independent living. It was really good and the rooms were all nice. I didn't have a problem with anything there. It looked like they had just about anything a person would need, like a hair salon and an exercise room, and other things to remain active and involved. The staff seemed very friendly and very capable. Treeo Orem is a really nice place with really friendly people. I like it. The food is really good with a good selection. My father plays Bingo there and his room is nice. He got the 2-room apartment and he really likes it. He's been in there since the very end of June, which has only been a month. It's modern, it's new, the people are really friendly, the management seems to care, and they have good food. The lady that's in charge has been doing this for many years and the sales people totally understand the crowd that they're selling to and they really understand how to make it nice and welcoming. My brother has eaten there a lot and he said it is really good and he liked the selection. It's more of a restaurant, like if you want a burger or if you want a chicken, etc, you can have it. The facility is absolutely spectacular. They're good at what they have, but the other places had more activities. My father enjoys what they have, but I wish they had a little bit more like one or two in the morning, one or two in the afternoon, and then something at lunch. It's the least expensive of all the facilities that I liked the most. For a 2-bedroom, it's $700 cheaper and I like that. The best way to get to know a community is by scheduling a tour. See the facilities, meet the staff and residents, and get a feel first hand what it's like to live at Treeo Orem Independent Living. Today's seniors deserve a modern, luxurious home where they can enjoy their retirement - and that's exactly where Treeo - Orem comes in. 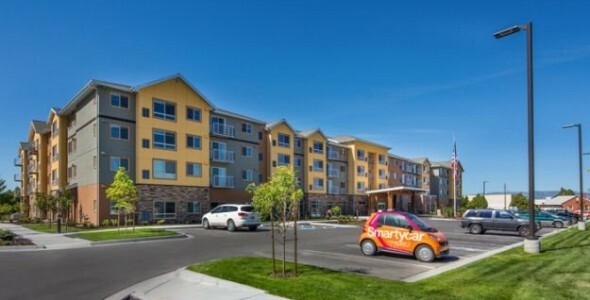 Our community was designed for seniors who want to live smartly, comfortably and affordably, while also enjoying one of America's most beautiful and enjoyable cities. Treeo - Orem is managed by Leisure Care, a Seattle-based company that has been serving seniors since 1976. As one of the largest, privately-held retirement and assisted living companies in the nation, we strive to create happy residents, families, employees and partners. Every aspect of life at Treeo - Orem has been carefully designed to meet your expectations. Your life begins upon move in, and we give you an iPad with our Treeo Connect mobile concierge included. It continues with our wide array of social and recreational programs, which keep our residents active and feeling their best. Residents can choose between studio, one-bedroom and two-bedroom apartments, each of which has plenty of space, a dishwasher and washer/dryer to make life easy. And no matter where you decide to go throughout our community, you'll enjoy free Wi-Fi, allowing you to always stay connected. For times you want to disconnect, our beautiful outdoor patios are the perfect place to relax. One of the biggest perks of retirement is relinquishing the little tasks that have taken up countless hours over the years. That's why we take care of housekeeping and maintenance, allowing you to spend your time the way you want. For times you don't feel like driving, our scheduled transportation services will get you where you need to go. And our staff is available around the clock to help with anything else that's needed. Come mealtime, you'll be able to dine the way you choose. For our gifted home cooks, our apartments feature full kitchens. For those who want a more restaurant-style experience, we offer flexible dining options with plenty of healthy, delicious menu items. And when your sweet tooth starts calling, an on-site ice cream parlor is here to answer. Those who choose Treeo - Orem have the opportunity to enjoy a retirement that is as modern and active as they would like.